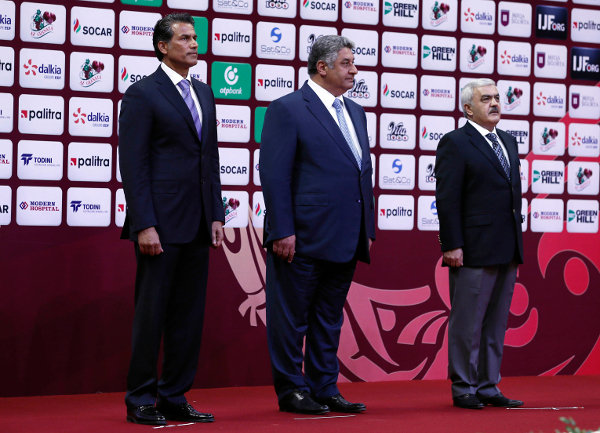 The Baku Grand Slam 2016 opened on Friday at the Heydar Aliyev Sport and Exhibition Complex with a compelling day of judo as Rio 2016 hopefuls suffered a mixture of pleasure and frustration in a pivotal first day in Azerbaijan. Baku is the sixth stop on the IJF World Judo Tour during the 2016 Olympic season following Grand Prix events in Havana (CUB), Dusseldorf (GER), Tbilisi (GEO), Samsun (TUR) and the first Grand Slam of the year in Paris (FRA). 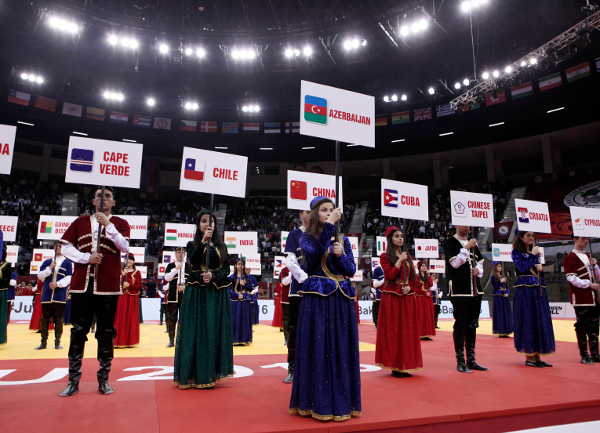 Azerbaijan’s premier annual sports event started with five categories in action on the opening day as the women’s -48kg, -52kg and -57kg categories and the men’s -60kg and -66kg categories took centre stage on the three tatami. The opening ceremony was held prior to the final block as the capacity crowd looked on with intrigue. Mr. Rovnag ABDULLAYEV, Azerbaijan Judo Federation President, made the welcoming address on behalf of the hosts and officially opened the three-day event. On Saturday the action in the capital city continues on the three tatami with four weight categories competing as the women’s -63kg and -70kg judoka will be competing alongside the men’s -73kg and -81kg judoka. Domestic interest will rest largely around European champion and world number one Rustam ORUJOV (AZE) while world champion NAGASE Takanori (JPN) makes his 2016 bow and European Games winner Martyna TRAJDOS (GER) will hope to triumph again in Baku. Paris Grand Slam bronze medallist Julia FIGUEROA (ESP) was the overwhelming force in the -48kg category as the Spaniard won all four of her outings to top the podium in Baku. The 25-year-old, who is on course for her first Olympic Games, did not need to compete in the final as her would be opponent CSERNOVICZKI Eva (HUN) was unable to fight due to sustaining a right knee injury in her prior contest. In the first semi-final Olympic bronze medallist CSERNOVICZKI beat Samsun Grand Prix bronze medallist Laetitia PAYET (FRA) in a scoreless bout as the Hungarian prevailed on the narrowest of margins. PAYET, who is now the leading contender for France for Rio 2016, was penalised on three occasions while CSERNOVICZKI was only penalised twice as the latter advanced. 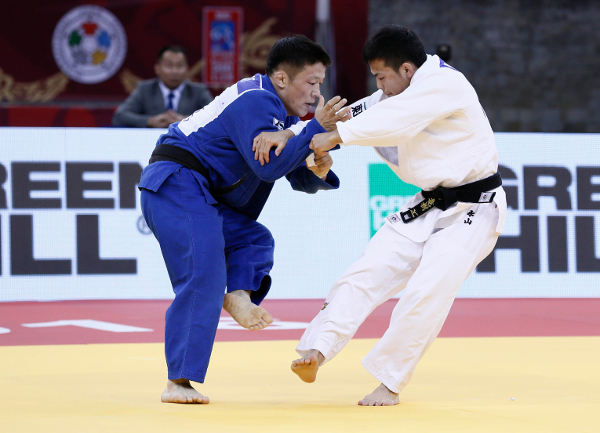 In the second semi-final the category’s in-form fighter Otgontsetseg GALBADRAKH (KAZ) was undone by the inspired FIGUEROA who won by ippon from a left ko-soto-gari with four seconds remaining. The first bronze medal contest was won by PAYET as four-time African Championships winner Taciana LIMA-BALDE (GBS) was forced to submit. The contest saw one of the shortest judoka in the category in PAYET against the tallest in LIMA-BALDE. With 42 seconds left and just a shido registered against PAYET, the French fighter was the sharper of the two in ne-waza and created the space to trap the left arm of LIMA-BALDE and tap out her opponent with a juji-gatame. The second bronze medal was won by GALBADRAKH who shaded European Championships bronze medallist Dilara LOKMANHEKIM (TUR). The Turkish fighter was penalised twice as she looked perturbed by something while Kazakhstan’s pocket-sized dynamo failed with a half-hearted uchi-mata attempt. A right-sided ouchi-gari was off the mark from LOKMANHEKIM who received a second shido but remains Turkey’s hope for Rio 2016 despite this defeat. World number 12 Odette GIUFFRIDA (ITA) entered the -52kg final as the favourite against Samsun Grand Prix bronze medallist Gili COHEN (ISR). Tbilisi Grand Prix winner GIUFFRIDA, 21, boasted a 4-1 head-to-head record against her opponent coming into the final but this time the contest and spoils went to to COHEN. GIUFFRIDA lost her balance during a tai-otoshi attempt but COHEN was slow to react. COHEN showed her resolute defence moments later as she resisted the shime-waza of the Italian in the form of a koshi-jime strangle. Golden score was needed and while a score still didn’t materialise a shido for the Italian did after three minutes and COHEN celebrated her first Grand Slam gold medal. In the first semi-final world number three Erika MIRANDA (BRA) lost out to Italian young gun GIUFFRIDA (ITA) in golden score. With no scores on the board and two shidos against both judoka, the added time was required which sees the first score or penalty determine the winner. Only 29 seconds were required for MIRANDA to receive a third shido which handed GIUFFRIDA the victory and a place in the final. In the second semi-final Samsun Grand Prix bronze medallist COHEN (ISR) was unable to trouble the scoreboard but still managed to eclipse Asian Championships silver medallist MA Yingnan (CHN). MA was penalised twice which was once more than COHEN who claimed the scoreless contest and the right to fight for gold in Baku. The first bronze medal contest was decided with 16 seconds remaining as a low left-sided morote-seoi-nage from world number eight MA saw off former World Judo Masters silver medallist Laura GOMEZ (ESP) by ippon. The second bronze medal was won by Asian Championships bronze medallist MUNKHBAATAR Bundmaa (MGL) as MIRANDA was beaten twice in Baku which is a rare sight on the international stage. Mongolia, who have picked ADIYASAMBUU Tsolmon at this weight for Rio 2016, added one more medal to their Baku collection as MUNKHBAATAR took the lead with a waza-ari from an uchi-mata and added a yuko by osaekomi with a ushiro-kesa-gatame. MIRANDA could not find a route back into the contest and it was MUNKHBAATAR who screamed with delight after securing a fine bronze medal. 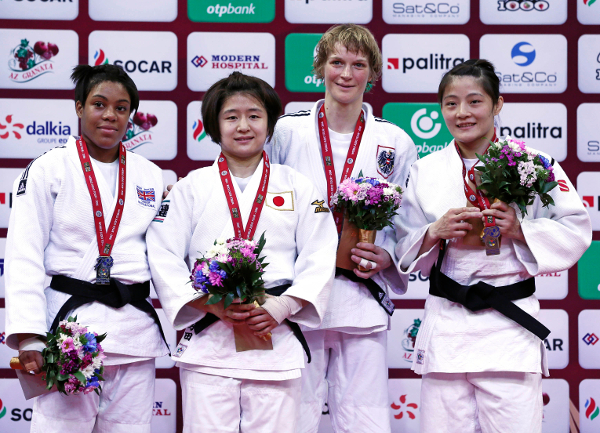 Tokyo Grand Slam winner YOSHIDA Tsukasa (JPN) won the -57kg gold medal on Friday as she overcame Samsun Grand Prix bronze medallist Nekoda SMYTHE DAVIS (GBR) in the final. YOSHIDA, 20, who has missed out on selection for Rio 2016 with reigning Olympic and world champion MATSUMOTO Kaori (JPN) naturally receiving the nod, was rampant in the final as she produced three scores without reply in a fine outing. The result gave world number 13 DAVIS the second Grand Slam silver medal of her career as she continues to grow in stature on the IJF World Judo Tour. In the first semi-final former Qingdao Grand Prix bronze medallist LU Tongjuan (CHN) fell to SMYTHE DAVIS (GBR) by ippon after nine seconds as the Briton has become a household name on the IJF World Judo Tour during the latter stages of this Olympic cycle. In the second semi-final YOSHIDA defeated former world bronze medallist Miryam ROPER (GER) at the halfway point as she produced a strong uchi-mata for waza-ari and held down her German opponent for 15 seconds to claim the contest. The first bronze medal contest pitted ROPER against fellow veteran Sabrina FILZMOSER (AUT) who was typically in action again in the final block. ROPER led by a waza-ari and looked to have one hand on bronze when she added a yuko but the German stalwart hurt her shoulder and that changed the course of the contest. 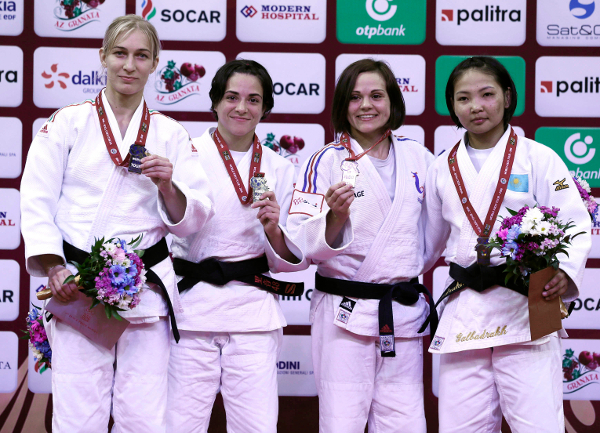 FILZMOSER took full advantage as she pulled back a waza-ari and added a second from an ouchi-gari to come from behind to seal her place on the podium. 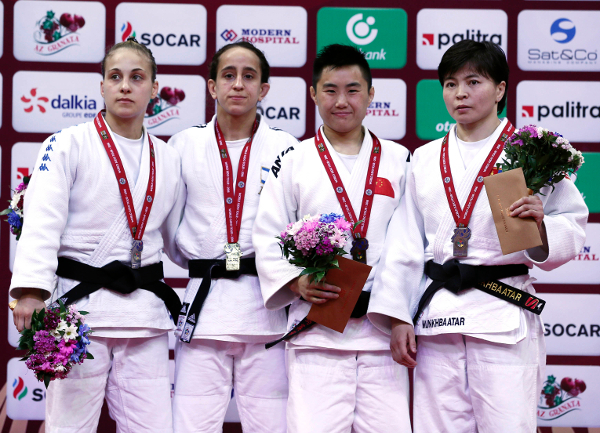 The second bronze medal was won by beaten semi-finalist LU who delivered the greatest performance of her career to see off former world champion Rafaela SILVA (BRA). LU was competing in a Grand Slam medal contest for the first time and won at the first attempt. SILVA countered a ko-uchi-gari for a utsuri-goshi but LU was wary of the threat and turned onto her front. A shido against SILVA settled the contest after four minutes with neither judoka able to score. 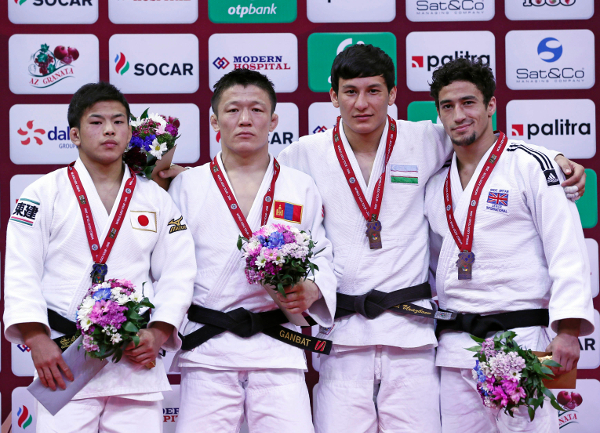 Former world champion GANBAT Boldbaatar (MGL) came to Baku with a point to prove having been overlooked for selection for the Olympics this summer and did everything he could to revitalise his credentials in Azerbaijan. Junior world champion NAGAYAMA Ryuju (JPN) was his unexpected adversary in the final after a superb display on his IJF World Judo Tour debut which exceeded all expectations. GANBAT could not find a way to score against NAGAYAMA but instead relied on shido penalties as he won 3:4. The fourth and final penalty for the young Japanese judoka was given for passivity as he received hansoku-make but on this showing will be a name to look out for in the next Olympic cycle on the road to Tokyo 2020. In the first semi-final NAGAYAMA defeated former world silver medallist DASHDAVAA Amartuvshin (MGL) with a ruthless display. The 20-year-old lifted DASHDAVAA off the ground with ease as his ura-nage earned a yuko score. NAGAYAMA did not let up and won by ippon to ensure he would compete in the final on his senior debut. In the second semi-final former world champion GANBAT Boldbaatar (MGL) was able to absorb every attack offered by Sharafuddin LUTFILLAEV (UZB) to register a yuko which was the solitary score of the energetic contest. 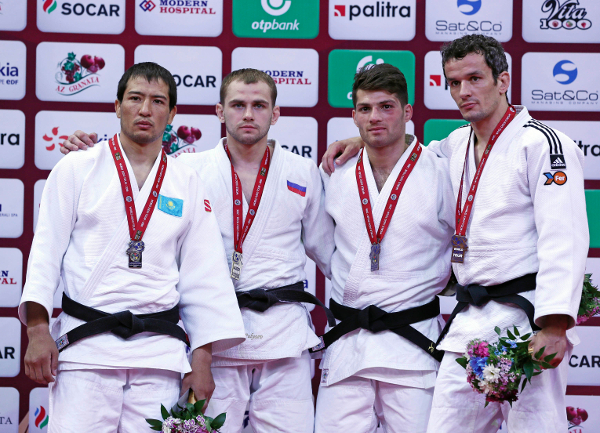 The first bronze medal was claimed by Asian Championships silver medallist Diyorbek UROZBOEV (UZB) as he beat teammate LUTFILLAEV in a frustrating contest. Both judoka were reluctant to engage and were repeatedly penalised for their inaction as the Uzbek duo both had three shidos apiece to their names after just two minutes. A final shido for passivity against LUTFILLAEV settled the contest in favour of UROZBOEV. The second bronze medal went to former European bronze medallist Ashley MCKENZIE (GBR) who returned to the IJF podium for the first time since July 2015 with a bright performance which culminated with a win against DASHDAVAA. The opening saw a positive start from the lively Londoner MCKENZIE who produced the better of the attacks but still without threatening the scoreboard. Golden score was required to separate the judoka after both finished regular time with two shidos on their record and no scores. London 2012 Olympian MCKENZIE won through as DASHDAVAA was penalised for passivity after 90 seconds of additional time. Double world silver medallist Mikhail PULYAEV (RUS) left little doubt of who is Russia’s premier judoka in the -66kg category with a golden showcase at the final Grand Slam in the Rio 2016 Olympic qualification phase. Asian Games bronze medallist Azamat MUKANOV (KAZ) opposed PULYAEV (RUS) in the final with the Russian eager to show his best judo having not been picked for the European Championships in Kazan last month. PULYAEV, who said afterwards that he considered himself to be Russia’s number one in the category before today’s competition, threw MUKANOV for ippon after just 29 seconds to top the podium while MUKANOV has a platform to go one better at his home event next week as the IJF World Judo Tour lands in Kazakhstan for the Almaty Grand Prix. In the first semi-final Dusseldorf Grand Prix bronze medallist PULYAEV bested former world silver medallist Sugoi URIARTE (ESP) by a yuko score while in the second semi-final surprise package Kenneth VAN GANSBEKE (BEL) tapped out to a juji-gatame from Asian Games bronze medallist Azamat MUKANOV (KAZ) after just 78 seconds. The first bronze medal was won by home judoka and former Abu Dhabi Grand Slam silver medallist Tarlan KARIMOV (AZE) who beat VAN GANSBEKE by ippon after 61 seconds of golden score. The second bronze medal went to Spain’s URIARTE who won the battle of youth versus experience as he defeated 21-year-old European Championships bronze medallist Fabio BASILE (ITA) by a yuko.